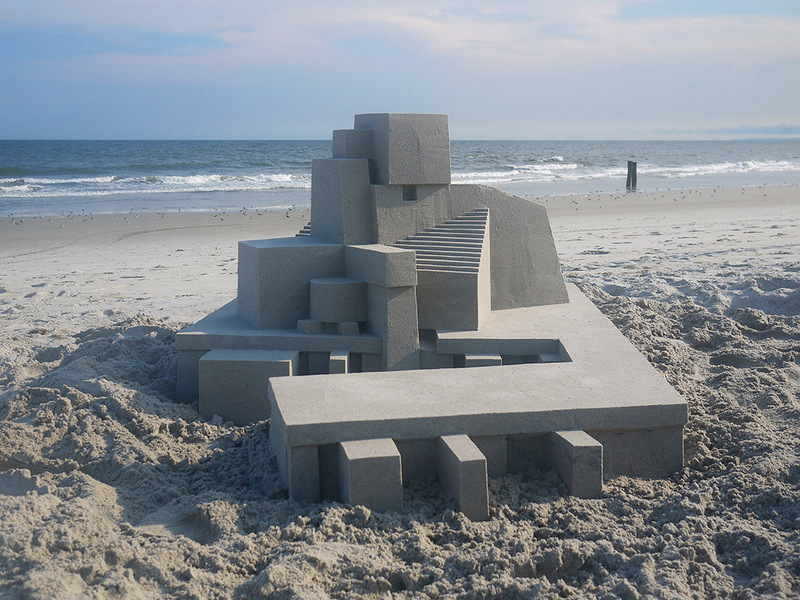 Professional sculptor, Calvin Seibert spent time this past summer on Rockaway Beach in Queens making geometric sandcastles that would make architects jealous. Building “sandcastles” is a bit of a test. Nature will always be against you and time is always running out. Having to think fast and to bring it all together in the end is what I like about it. I rarely start with a plan, just a vague notion of trying to do something different each time. Once I begin building and forms take shape I can start to see where things are going and either follow that road or attempt to contradict it with something unexpected. In my mind they are always mash-ups of influences and ideas. I see a castle, a fishing village, a modernist sculpture, a stage set for the oscars all at once. When they are successful they don’t feel contained or finished. They become organic machines that might grow and expand. I am always adding just one more bit and if time allowed I wouldn’t stop. Swedish scientist, Simon Morris has created a levitating planter called Lyfe. Powered by magnetism, the planter hovers over an oak base and turns slowly to give equal sunlight to each side of the plant. See more about Lyfe on their Kickstarter page. Natural light plays a large role in growing most plants indoors, until now. The new Mygdal Plant Lamp by Emilia Lucht and Arne Sebrantke of the German design studio We Love Eames promotes growth in windowless spaces such as hotels, restaurants or some homes. It doesn't require ventilation or irrigation but interprets the LED as sunlight, allowing for photosynthesis to occur. The light is a self-sustaining ecosystem where the plants can thrive for years in part due to the electrically conductive glass coating (patent pending).